This last Saturday was Arduino day, where around the world there were seminars and projects being shown off. St. Louis didn't have any local events, so I watched a few of the online presentations and worked on my Little Computer Person project. I had a lot of similar code for the project written for a Windows app. After a chunk of code rewriting, I was able to shoehorn in a minimal AI and pathfinding algorithm. 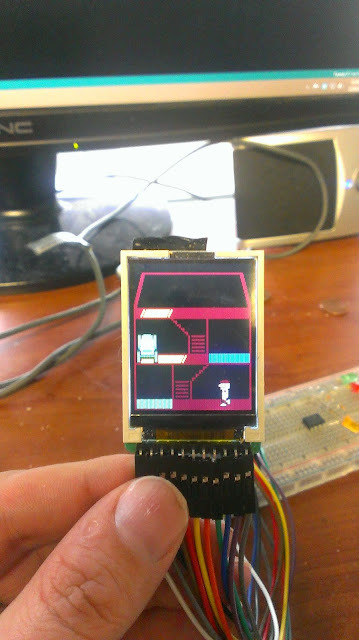 For the project, I am using a Teensy 3.1 and the ST7735 LCD. Most of the fighting I had to do was converting my code from a C++ 11 implementation to it. After 2 days, it all came together. Now, my little guy will build up a queue of things to do and walk to the positions where those things will be, using the stairs correctly to get between floors. Currently, with 2 sprites and all the AI processing, I get about 30 frames per second with no flickering.